Chanuka commemorates the miracle of God’s saving the Jews during the time of the Greek empire. The Greeks wanted to destroy Judaism and Jewish practices and have the Jews follow the Greek culture and religion. A small group of Jews defeated the Greek army, which was the world’s greatest military force at the time. Contrast Chanuka with Purim (on Purim, the Jews’ physical lives were in danger while on Chanuka, their religion was being threatened). The main miracle of Chanuka was in defeating the Greeks; the oil’s burning for eight days was secondary. Eight days were required for the people who had contact with dead people to become ritually pure in order to make new olive oil. Chazal have the authority to make laws, so we say “Who sanctified us with His mitzvot and commanded us” (asher kidshanu b’mitzvotav v’tzivanu) for Chanuka blessings and other purposes that Chazal instituted after the Torah was given. It is a non-binding custom to eat potato pancakes (latkes) on Chanuka; in Israel, it is also a non-binding custom to eat jelly-filled doughnuts (sufganiyot). The reason for lighting Chanuka candles is to publicize the Chanuka miracle (pirsumei nisa). 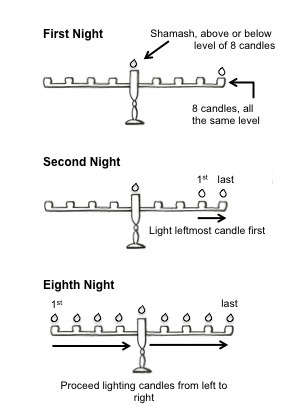 All eight candle holders of a chanuka menorah must be on the same level. The menorah itself may be curved horizontally. The shamash must be slightly raised or lowered or to the side of the menorah or in the center, as long as it clearly is not part of the other eight candles. Note: You may put oil lights directly onto a windowsill or other level surface, but candles must be in or on some type of holder. The basic commandment is for one Chanuka candle to be lit per house per night. The extra candles (matching the number of days in Chanuka) and having every male light his own menora is an enhancement and a custom. Note: Having every male in the family light his own Chanuka candles is a universally accepted but non-binding custom among Ashkenazi Jews. You only need one service (shamash) candle for any amount of Chanuka candles/oil lamps (menorot) in the same area. Anyone in the household who has reached bar or bat mitzva age can light Chanuka candles, thereby fulfilling the halachic requirement that one candle per household per night must be lit. Light Chanuka candles for yourself, even if there are no other people around. If there are other people asleep in the house who have not fulfilled the mitzva of lighting Chanuka candles, you should wake them so they can see the candles. Do not wake children below gil chinuch. Women, like men, are required to light Chanuka candles or have them lit for them. Note: It was not traditionally customary for women and girls to light when men were present. The custom is that in a house in which the husband lights Chanuka candles, the wife does not also light. However, a wife is required to light if her husband is not present, and girls (above 12 years old) are required to light if no men are present. A wife may light Chanuka candles for her husband if he is not home. Note: If your wife lit for you and you return late at night, you do not need to light for yourself. Light Chanuka candles in your own house, unless you are not in the city in which you live. Note: Even though the menorah is for publicizing the miracle, Chazal set the observance to take place in each person’s home (and not in groups at one home with several families together). You may place Chanuka candles anywhere (but they should be lit wherever you are staying). Outside of Eretz Yisrael, it is customary to place them by a window, ideally facing the street. Note: Consult a rabbi as to whether candles should be lit inside an aquarium or other box as is sometimes done in Israel, since the candles should not be lit in a place where the wind would blow them out if not for the box around them. Chanuka candles should be lit after dark (except on Fridays). Note: You may light chanuka candles as much as 1 ¼ hours before dark (not 1 ¼ hours before sunset!) but the ideal and proper time is after dark. Note: Although eating a snack, working, and other activities are permitted before lighting the candles, nothing should be done that might make you forget to light the candles, and it is best to light the candles as soon as possible. Latest time to light Chanuka candles: 102 minutes before sunrise (so they will burn for 30 minutes before daybreak). Wake up sometime during the night and light the Chanuka candles if you fell asleep before dark. Chanuka candles must burn for at least 30 minutes after dark. A Chanuka candle (or candles) that is expected to burn for at least 30 minutes does not need to be replaced or relit, even if it burns out in less than 30 minutes. You do not need to relight Chanuka candles that blew out after having burned for less than 30 minutes after dark, if they had been lit in a place where they would not be expected to have blown out. If they were lit in a windy or drafty place, you must relight them in a different place and say the blessings again. You may not use light from Chanuka candles for any purpose (do not read by them; do not light other candles from them, except from the shamash). Do not do any “work” while the Chanuka candles are burning. Reason: In order to show that we are not using the candles for any other purpose. Note “Work” may include some housework but usually means skilled labor done by professionals that may not be done on chol ha’moed and that requires light to do it. Light Chanuka candles from left to right, as you face it, not as it will be seen from outside the window. Add the new candle from right to left. For example, on the first night, put the candle on the extreme right of the menora. Set up the candles starting from the right side of the menora. She’asa nisim l’avoteinu ba’yamim ha’heim ba’zman ha’zeh. (And on the first night, add) Shehecheyanu. 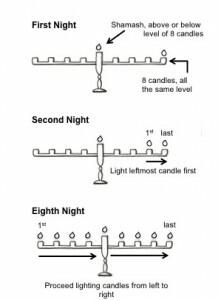 Light the left-most candle first and proceed to the next candle on the right, and so on. Once you have lit the first candle each night, say ha’neirot hallalu (this is a halacha). Note: Once the menora has been lit, you may not turn or move it, even to the window. Note: Saying Ma’oz Tzur is a widespread custom but is not required. On Friday of Chanuka, light Shabbat candles after Chanuka candles; at least one Chanuka candle must burn until at least 30 minutes after dark. If a man forgets to light the Chanuka candles, he may still light them until sunset or until he says Mizmor shir l’yom haShabbat, whichever comes earlier. But women start Shabbat when they light the Shabbat candles and so they may not light Chanuka candles after lighting Shabbat candles. Even if your first time is the second or subsequent nights. Even if someone lit for you the previous night. A Chanuka menorah in a synagogue should be set up at the front of the synagogue, oriented east-west, and lit while standing on the south side and facing north (the person lighting will be facing toward the inside of the synagogue). The Chanuka candles in synagogue do not need to burn for 30 minutes after dark or even for any 30-minute period but that is the ideal minimum duration for burning. If you light the Chanuka menorah in the synagogue on the first night of Chanuka, say shehecheyanu in synagogue. When you go home, if you light only for yourself, do not say shehecheyanu again. However, if you light for your wife or for any adults including children above the age of bar or bat mitzva, say shehecheyanu again. When Chanuka coincides with Rosh Chodesh, say full hallel (as is done on all days of Chanuka, instead of the “half-hallel” that is said on Rosh Chodesh). Copyright 2015 Richard B. Aiken. Halacha L’Maaseh appears courtesy of www.practicalhalacha.com Visit their web site for more information. This material is provided for informational purposes only – not a substitute for the consultation of a competent rabbi.